Yeah, you read that correctly: ‘24xCD’. As it happens there are only 24 of these in the world as well, so it’s likely you will have to download this if you want a copy. In 2010, Rothkamm was diagnosed with Tinnitus, so he started to research a source of medication by sound treatment that would either mask or eliminate the high frequencies he is subjected to on a daily basis; unfortunately for the rest of his life. 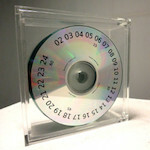 Frank seeded the work here from a single algorithm and split into 24 one-hour ‘zones’ over the complete boxed CD’s. In fairness it’s ludicrous and to the majority of you out there (myself included), you will hear nothing but different pitches of hisses and whirs that will drive you insane. I am torn here, as I have to review this as a work of ‘music’. Maybe it’s art and this in itself maybe is actual music in one form or another; but to me it’s nothing more than one mans experiment into treating a horrible illness. If it does end up aiding him with his issues, then more power to him (if indeed it helps others as well, I will applaud him); but as an album release, this is nothing more than pure self-indulgent rubbish, and my score in this case is based on musically properties alone.